A “meh” day on Wall Street… a cannabis Super Bowl commercial (for real)… readers’ critical takes on buybacks… and more! Well, we won’t get into the nitty-gritty here. You’ve surely seen the headlines about Amazon founder Jeff Bezos and the National Enquirer. But the story reminds us that Amazon is among many companies that have been the target of hostile presidential tweets the last couple of years. Actually, company-specific tweets both hostile and friendly preceded Donald Trump’s accession to the White House. But never mind the short-term stock moves: “What were the long-term consequences of being on the president’s good or bad side?” Mr. Ritholtz wondered. “To find out, we created a pair of indexes and tracked them for a year,” he goes on. Go figure: In 2017, the Drain the Swamp index trounced the Oligarch index. And the same goes for 2018. 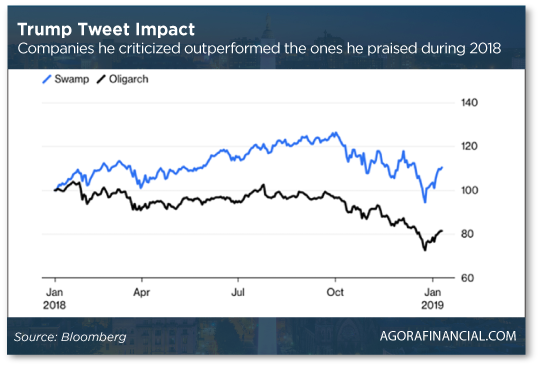 The index of swampy companies “not only beat the Oligarch again, it crushed it, rising 6.3%,” says Ritholtz. “That is a 29 percentage point advantage for Trump’s most hated companies over his most favored ones.” Heck, it’s an even bigger spread than the 23 percentage points in 2017. Amazon, you wonder? Up 32% last year despite a 40% skid from Labor Day through Christmas. The broad market is faring better than Amazon today, but that’s not saying much. At last check the Dow has shed another 200 points to fall back below 25,000. The S&P 500 and the Nasdaq are holding up a little better. Gold is moving little at $1,313. Crude is up a bit at $52.81. No major economic numbers today; it appears the Commerce Department won’t even try playing catch-up after the “partial government shutdown.” The agency is basically skipping a month and will slowly get back on track by the end of February. Well, assuming the shutdown doesn’t resume a week from Friday. “The state of the American economy is strong by any measure. “Our job market created more than 300,000 new positions last month,” he declares. “And workers are enjoying higher wages, with growth averaging over 3% for the last six months straight! Unemployment is at historical lows even with the negative effect from the government shutdown. “At the same time, corporations are growing profits. Some media outlets are voicing concerns that growth is slower than it was a year ago. But that’s only natural given the material tax cut that boosted corporate profits in 2018. Some ‘moderation’ of growth is to be expected, but its rate is still very healthy. Small wonder then that the stock market has recovered strongly from its Christmas Eve lows. “After markets traded sharply lower in the fourth quarter (especially in December), 2019 has been the mirror opposite,” Zach continues. “Stocks continue to climb higher, and despite this rare late-week sell-off, this has been the strongest start to a new year in decades. “In fact, January’s 7.9% advance was the strongest rally for the month since 1987. And statistically, markets have a very high tendency to follow January’s direction for the rest of the year. Skeptical? So is your editor. (I was the one who pressed Zach late last year about why he’s “so darn bullish.”) But right now the evidence remains on the bullish side of the ledger. Both of the reliable recession indicators we follow at The 5 — one from the Chicago Fed, the other from the Philadelphia Fed — are nowhere near recession territory right now. “The first hearing on marijuana from the new Congress is already in the books,” says our penny pot stock authority Ray Blanco. “Not being able to have bank accounts creates all sorts of other problems for companies trying to stay compliant with state and federal employment laws,” says Ray. “Even something as trivial as payroll becomes a logistical nightmare. “There have been cases of couriers being attacked and robbed leaving cannabis businesses because criminals know that they may be carrying large amounts of cash. “Opening up the banking system to legal cannabis companies will boost profitability and open up new sources of capital. “Rumor has it that next week’s hearings are a precursor to a planned vote on an actual marijuana banking bill in the next couple of months,” Ray says with his ear to the ground. Even if it isn’t, Ray’s got some names on his radar that are poised to move. They’re part of his Marijuana Millionaire Playbook — just published and available for immediate download. Learn how to get your copy at this link — no long video to watch. OK, it turns out there was a weed commercial during the Super Bowl. But the owners of CBS’ affiliate in the U.S. Virgin Islands threw caution to the wind — and ran a cannabis spot during a local station break. It featured Positive T.A. 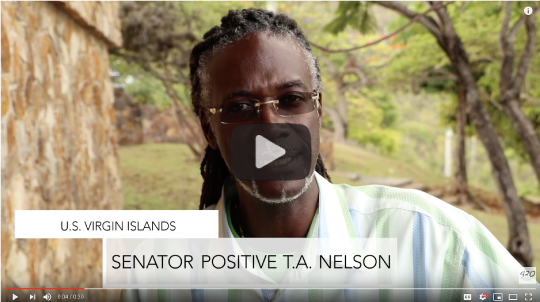 Nelson, a former senator in the Virgin Islands legislature, who led the charge for legalization of medical marijuana there. The commercial promoted the launch of a cannabis-themed video streaming service launching later this spring called Hmm Did You Know. We’re not sure that’s the best name for their service, but no one asked us…. “I noticed you mentioned that health care spending will consume 50 cents of every dollar spent in this country by the early 2030s,” a reader writes. The 5: Our most recent in-depth exploration came a little less than a year ago. If we have updated figures for 2018 soon — they might be delayed by the shutdown — we’ll pass them along. “While it is true that stock buybacks and dividends benefit everyone who owns stock,” writes a reader after Wednesday’s 5, “the vast majority of the outstanding shares in the market are owned directly or indirectly by the top 1%. “Most of the remaining people, who do not benefit in any way from dividends and stock prices, are exactly the ones on whose backs the ‘cash hoards’ have come from. “Why is it that neither The 5 nor the Democrats are addressing the two truly negative aspects of stock buybacks?” writes another. 2) When done in conjunction with management incentives tied to earnings per share (EPS)? The 5: Our 5 Mins. didn’t allow for the subtleties the other day. But you’re right, up to a point. Some buybacks with borrowed money made total sense a few years ago. The classic case was Intel in 2012 — borrowing $6 billion at rates as low as 1.35% so it could retire shares paying a 4.3% dividend! But yes, borrowing for buybacks was getting out of hand by mid-2016. But there are so many instances of well-executed buybacks that have immensely prospered shareholders. Back in the day, Teledyne CEO Henry Singleton bought back 90% of the firm’s shares over nearly three decades — generating an average 20% annual return. More recently, AutoZone shrank its share count 75% from 2000–2013 — generating a compound annual return for shareholders of 21% compared with 3% for the market as a whole. Meanwhile, if your concern is about “the 1%,” your ire is better directed at the Federal Reserve — whose policies during this century have vastly enriched that small group (really, the top 0.1%) while real incomes for nearly everyone else stagnated or even fell. Of course, to the power elite’s thinking, that’s a feature and not a bug. P.S. One of our publishers is giving away 500 laptop computers between now and midnight tonight — well, unless your fellow readers claim them all sooner. Why would he do this? Answers here.